The Mt. 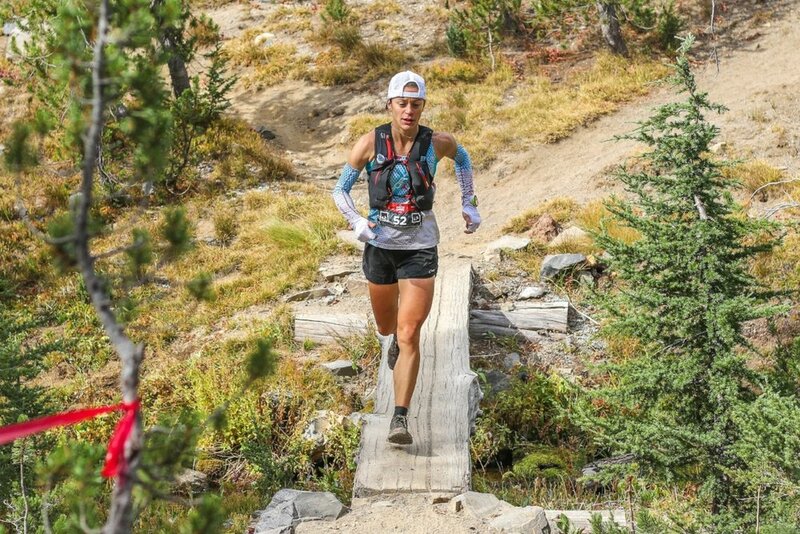 Bachelor 50km outside of Bend, Oregon is one of three races in the Under Armour Mountain Running Series. Rather than spending a full day in the car and trashing our hamstrings, we took advantage of cheap plane tickets and flew 50 minutes from Seattle to Redmond. From the Redmond airport, it was only 45 minutes to Mt. Bachelor. The dry, open landscape of central Oregon lends itself to endless trail opportunities and I was excited to explore some of the most scenic along the 50km course. Several miles of the race are on a gnarly rutted out service road, so Tad rented a huge truck with great clearance making it possible to drive up the road and check out the course two days prior to race day. Striding out the travel legs. I knew there was going to be limited course markings, so I spent a good bit of time studying the course to make sure I knew which direction I should be going. There are some sections that we had to cross over twice, and I always have nightmares about going the wrong way. Because there are no significant climbs to break up the race, I mentally broke the course up into three loops. My goal going into the race was to podium because – let’s be honest – there was money awarded to first, second and third places. The Bend area breeds a lot of speedy ladies, so I knew it would not come easy, especially on such a fast course at close to 7000 ft elevation. Ever since Go Beyond Racing introduced me to Longboard Louie’s burritos back in May at the Smith Rock 50k, I have been dreaming about them. So naturally it was high priority that we eat there ASAP upon arrival. The hilarious thing is that I posted this photo on Instagram Stories and won a free burrito! The day before the race we had the good fortune to meet the lovely Director of Operations & Strategic Development of Lily Trotter’s Compression for the first time face to face, and spent time catching up with our good friends Mario and Jade Mendoza. Mario placed 3rd in the 50k and then Jade birthed their baby boy shortly after! We got really lucky with our AirBnb rental, which was right off the Cascade Lakes Byway which is on the way to the course. Our hosts were extremely thoughtful and generous and even made me the sweetest good luck card which I found on the door when I woke up race morning. The thoughtful card made by the talented AirBnb host. It was 32 degrees at the start, but I warmed up with a puffy and carried handwarmers in my gloves, so I was plenty warm starting with just my singlet and arm-warmers. I decided on a hydration vest versus a hand-held water bottle because I wouldn’t be able to hold onto the hand warmers, and if my hands get numb (which happens often with my Reynaud’s) , then I am screwed and can forget about eating or drinking anything! The start line sat at 6,200 feet and the first 8 miles were downhill which meant a fast start. That altitude may not sound that high, but coming from sea level, it makes a significant impact on perceived effort and ability to eat, drink and breathe. The combination of the cold and the altitude left me gasping for air every time I tried to drink. I face-planted just 5 miles in but jumped up quickly. I was already alone, weaving in and out of a Ponderosa Pine forest. I fell again at 10 miles. Luckily that part of the trail is so soft and sandy that it was a comfortable tumble. I took a deep breath, stretched, regrouped and continued my solo pursuit up Flagline Trail. Towards the top, I saw movement and finally caught up to two men. It was nice to chat with them, albeit briefly, to get out of my head a little bit. They stopped at the aid station, but I continued onward. This is the first 50km that I have raced that was completely runnable; it was never steep or technical enough to have to hike so it was a relentless push. Each loop seemed to be endless! Constant turns required plenty of focus to keep momentum going especially when I was running alone. Miles 22, 23, 24 were a climb to the high point – just under 7,000 feet – and by this point in the race I was breathing so hard for so long that I started to feel lightheaded. I made sure to keep taking in calories as I knew I was expending more than if I was racing at sea level. The last 10km was the longest for me, but I felt encouraged when I saw Tad at the last aid station and he told me that I was moving well. I picked off a couple of men in the final stretch, squeaking into the top ten overall. The last trail was a popular mountain bike trail, but all the bikers were extremely courteous and immediately stopped and moved aside to let me pass. I thought that was really cool and just one example of how nice everybody is. Trying to stay focused all the way to the finish. After I crossed Cascade Lakes Highway, there was one more little climb just for kicks before coming into the finish where I was greeted by members of my trail family. Some people think the competition at the front of the pack is cutthroat, but in reality, most everyone is super supportive, encouraging and congratulatory. Final stats: Third place female, 10th overall, $250.00, no bee stings. Full results here. Cool chicks with big checks. Now I’m looking forward to a week off to recover and spend some quality time with my parents who are coming to Bellingham. The snow could be arriving in the North Cascades any day now, so it will be a push to get up in the mountains as much as possible before we are confined to Chuckanut Mountain for the winter. Under Armour had an awesome recovery station set up for post-race. As always, thank YOU for reading and for all your love and support that you give to me. Thank you to YiOu Wang, Keely Henninger, Chris Neilson and Katelyn Steen for hanging out for my finish. That really meant a lot to me! Thank you to the Under Armour team who provided a great race experience for me, from a smooth packet pick-up, to great volunteers, to immediate results thanks to chip timing and a fabulous recovery zone for after the race. Special thanks to Kerry Gustafson and Chris Lockwood for working on my cranky knee leading up to the race. I was able to run completely pain-free thanks to you! High-fives to Team Maria: La Sportiva, Trail Butter, Lily Trotter’s Compression, Native Eyewear and WILD Wellness. My crew of one: Tad – photographer, videographer, pack mule, shoe-tier, course mapper extraordinaire - I love you! If you’ve never crossed a finish line in your life you should try it. It’s the best. Trust me.